AUCKLAND, N.Z., THURSDAY MAY 22, 1919. THE ARRIVAL OF MAJOR-GENERAL SIR ANDREW RUSSELL AT CHRISTCHURCH LAST WEEK: CITIZENS WHO TOOK A PROMINENT PART IN WELCOMING HOME THE POPULAR COMMANDER OF THE NEW ZEALAND DIVISION IN FRANCE. MAJOR-GENERAL SIR ANDREW RUSSELL ON THE TRANSPORT ARAWA, JUST PRIOR TO DISEMBARKING. From left to right the names are: – Miss Russell, the Chief Officer of the Arawa, Lady Russell, Major-General Sir Andrew Russell, and Dr. Thacker, M.P., Mayor of Christchurch. 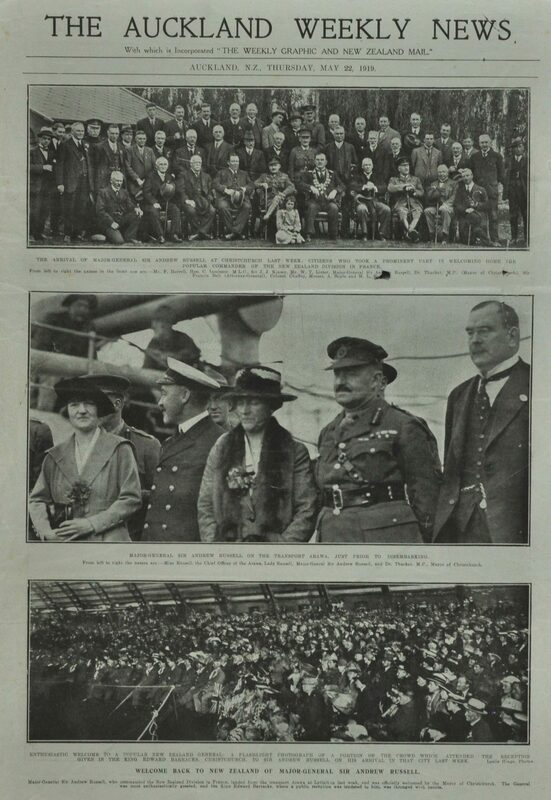 ENTHUSIASTIC WELCOME TO A POPULAR NEW ZEALAND GENERAL: A FLASHLIGHT PHOTOGRAPH OF A PORTION OF THE CROWD WHICH ATTENDED THE RECEPTION GIVEN IN THE KING EDWARD BARRACKS, CHRISTCHURCH, TO SIR ANDREW RUSSELL ON HIS ARRIVAL IN THAT CITY LAST WEEK. Leslie Hinge, photos. WELCOME BACK TO NEW ZEALAND OF MAJOR-GENERAL SIR ANDREW RUSSELL. Major-General Sir Andrew Russell, who commanded the New Zealand Division in France, landed from the transport Arawa at Lyttelton last week, and was officially welcomed by the Mayor of Christchurch. The General was most enthusiastically greeted, and the King Edward Barracks, where a public reception was tendered to him, was thronged with people.